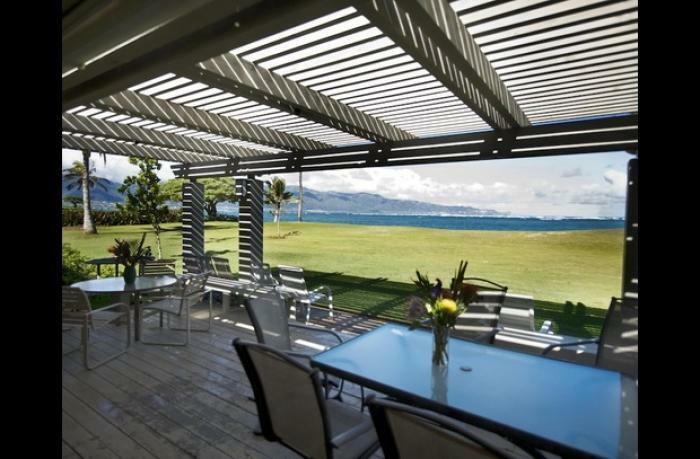 Hale Ola is an original island-style beach house with beautiful panoramic views of the West Maui's and Kanaha Beach Park. This generous sized one acre beachfront property, well known as "Honey Bun's", features your own fabulous white Sandy beach cove with a private windsurf and SUP launch, swaying palms, tropical plants and grassy lawn area with plenty of parking. Enjoy perfect side shore trade winds or watch the action from your ocean-front Jacuzzi! Spacious Hawaiiana themed living and dining areas open onto a covered outdoor lanai with a gas BBQ and entertaining area. Hale Ola is an excellent vacation home for those looking for an affordable yet private beach house. Perfect for water sports vacationers and families looking for some adventure!! Located in Spreckelsville on the North Shore of Maui. Just 3 minutes drive to Paia Town and 10 minutes to Kahului and Kahului airport. Kihei and Wailea on the South Shore is a 30-45 minute drive and Lahaina and Kaanapali on the westside is a 30-45 minute drive. Other beaches nearby include a 5 minute drive to Kanaha beach park, 2 minute drive to Baldwin and Baby Beach, 5 minutes to Tavares Bay and Ho'okipa Beach Park. This property is subject to airport noise.